For the last month I have pointed out that the trends that were established in 2015 are all reversing. That process continued this week, as one more turned positive, and one deteriorated closer to negative. Well, this has been just about the lightest week I can ever remember for economic news. Even the JOLTS report, which is usually issued the week after the jobs report, was put off until next week. So here are a few things to hopefully interest you until something actually, you know, happens. 1. 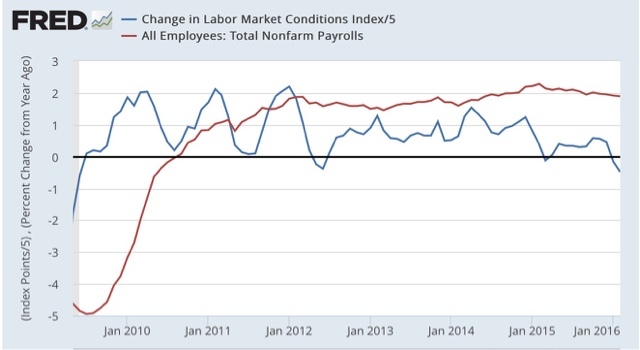 Labor conditions were negative, but there's no cause for imminent concern. We're not any worse than we were in 2012, so there's no cause for panic. 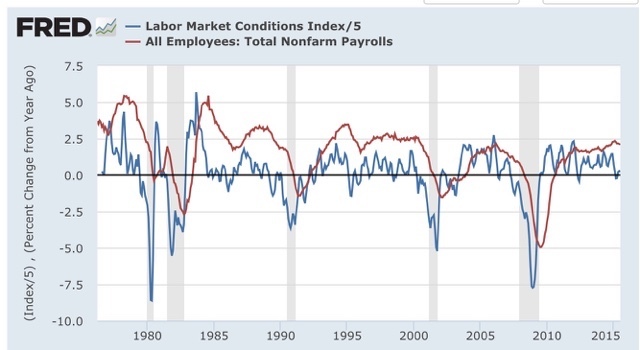 On the other hand, the continuing weakness in the LMCI indicates that were are going to get progressively weaker jobs gains in the coming months. 2. Wholesalers' inventory to sales ratio. OUCH! 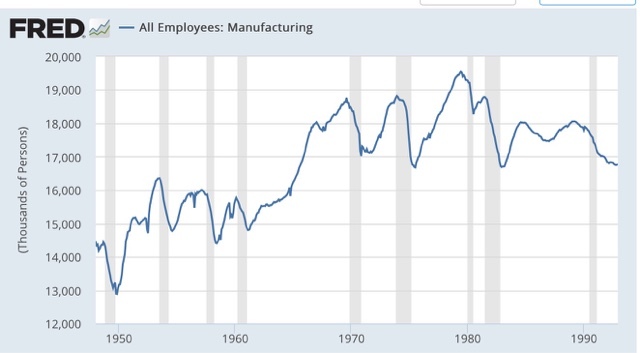 No updated graph, because FRED waits for retail sales to update total sales and inventory data. 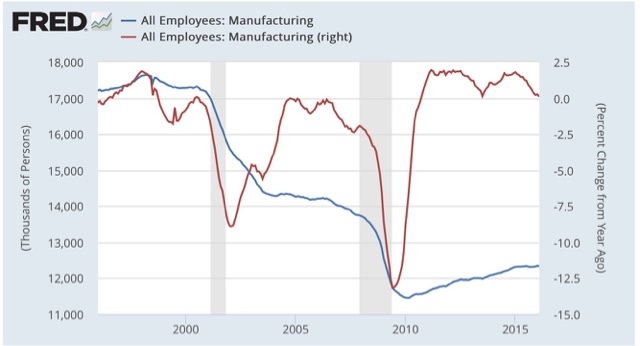 The high frequency weekly data has been pointing to a bottom in the shallow industrial recession. That wholesalers' inventories grew as well as sales falling contradicts that narrative. Bad news. Hopefully a one-month glitch? I dunno. 3. 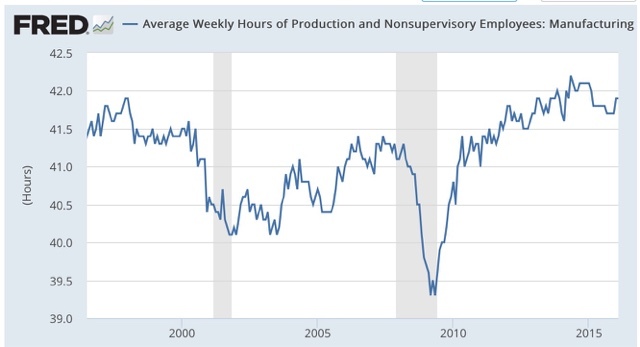 Can you really have a recession when nobody is getting laid off? I mean, seriously, how could that be even possible!?! 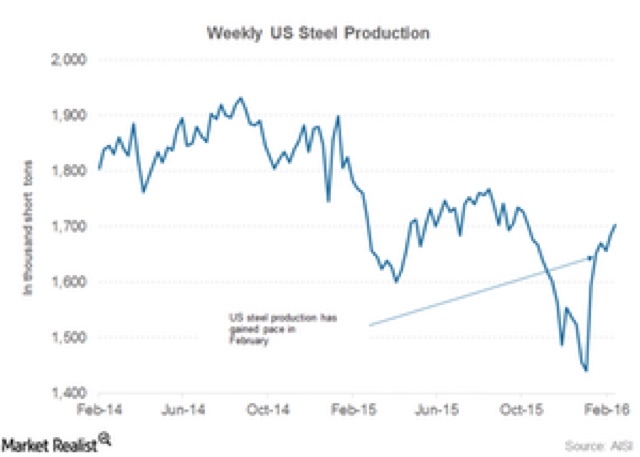 Steel does look like it has bottomed. Staffing not quite yet, although the YoY comparisons are clearly "less bad" than they were in the September through December frame. 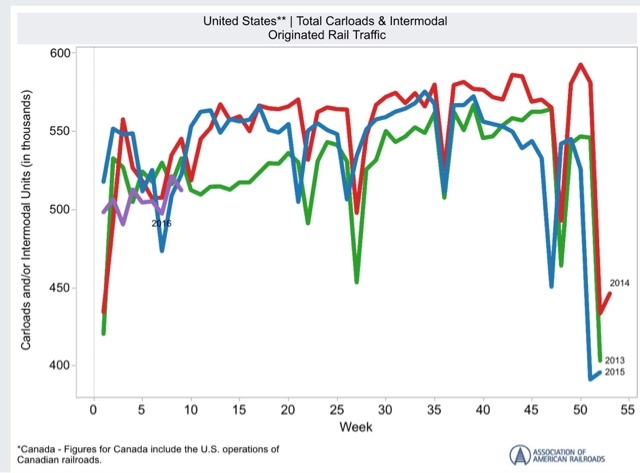 Rail is probably benefitting from less bad February weather this year - another two or three weeks of data will tell the tale. A majority of the 7 mid-cycle indicators should have turned south well before the beginning of a recession. Since lots of commentators are talking about recession now, I've taken an updated look at these 7 indicators. 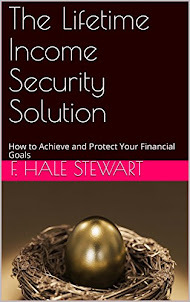 Part 2 of 2, with the conclusion, is up at XE.com. If the mid-cycle indictors haven't turned, talk of an imminent recession is clearly premature. So, have they? I take a detailed look in two parts. Part 1 is up at XE.com. 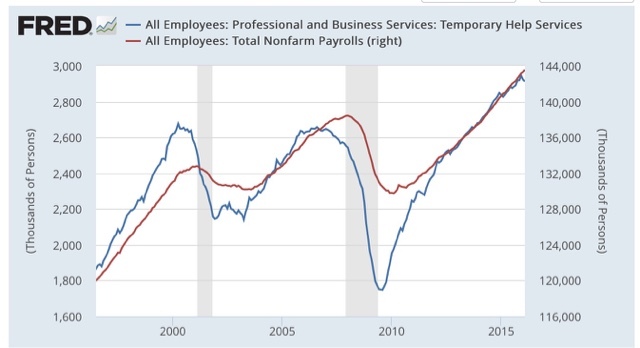 Every month when I discuss the jobs report, I have a section devoted to those parts of the report which tell us where the overall numbers are likely to go in the future. We may be at a turning point for those numbers, as 4 out of 5 either look like they are turning or have already turned. 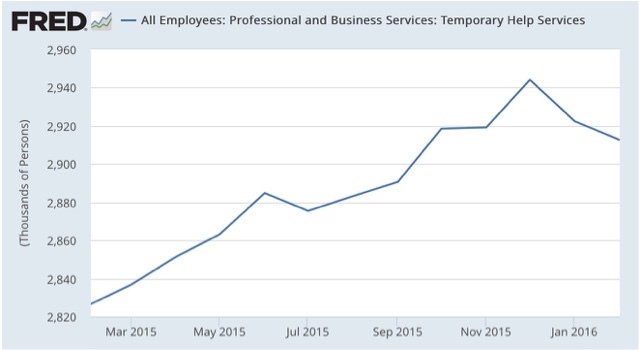 Note that these typically turn down about a year before the overall jobs numbers turn down. These look like they are making a peak now (or may have made a peak 2 months ago). These are quite noisy. But they have not made a new low in 5 months. In the post-World War 2 era, these sometimes but not always peaked significantly before the onset of a recession. Sometimes they went sideways for awhile before rolling over as well. These have pretty clearly gone sideways in the last year, and the first derivative has declined. This is one of the actual components of the LEI. 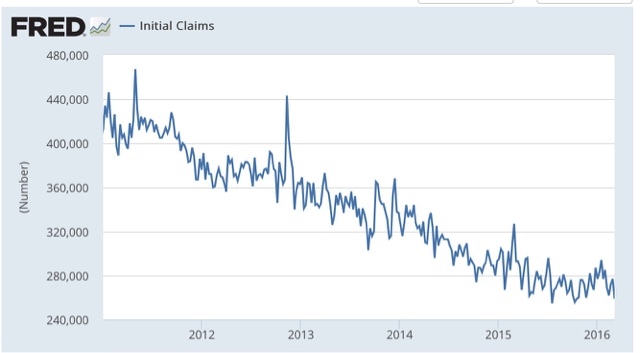 Note that these peaked almost two years ago, although they are improving off their recent bottom in late 2015, thus being consistent with an ebbing of the shallow industrial recession. 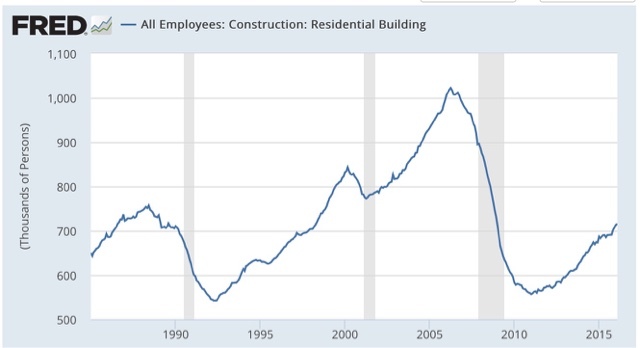 These are still growing, as the housing sector is doing quite well. 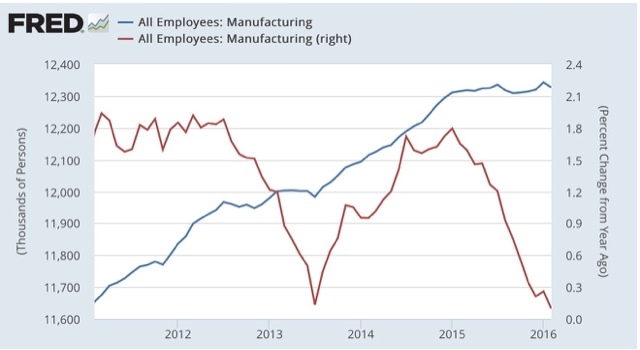 The poor improvement in manufacturing jobs is a representation of the shallow industrial recession in the economy during the past year. 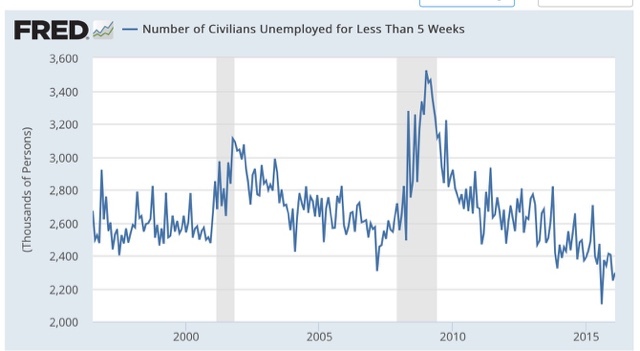 But the other three either have not made new highs in months, or even going on two years, suggesting that the overall labor market is decelerating. 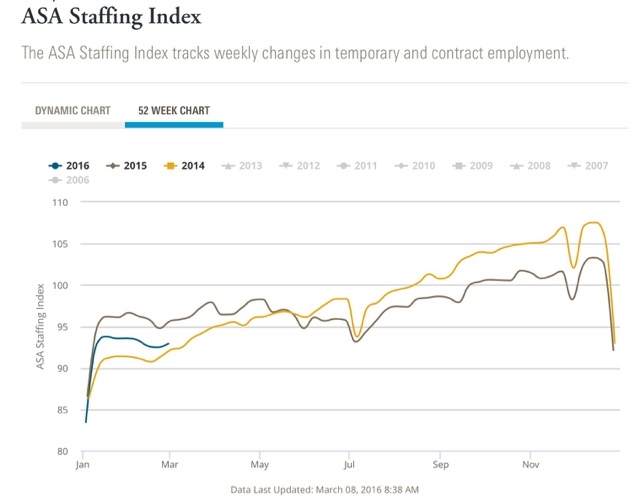 This is a caution flag for jobs possibly turning negative next year.